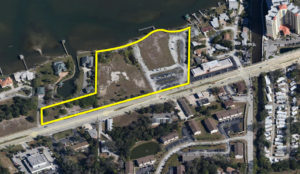 There is currently a submerged land lease in place for a dock/fishing pier, however previous site plans and approved PD agreements with the City of South Daytona did include wet slips. This is an excellent location, just 2.5 miles to the beaches via Dunlawton Ave, 5.5 miles to the Daytona International Airport. Multiple shopping venues, .34 miles to Sunshine Mall , a Publix anchored shopping center, 6.95 miles to One Daytona, and 9.04 miles to the newly completed Tanger Outlet Mall. Further afield, the location is just a quick 90 minute drive to the Orlando attractions. By boat, the site would allow 20-25 minute transit to the Ponce Inlet for Atlantic Ocean access.